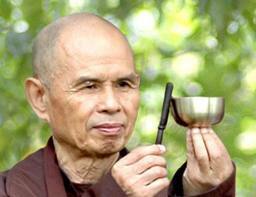 One of the most inspiring and well-known Buddhist teachers of our time, Thich Nhat Hanh, Vietnamese Zen master, poet, writer and peace activist, is the founder of Engaged Buddhism, which integrates mindfulness practice into everyday life. Exiled from Vietnam during the Vietnam War, he founded Plum Village in France, a mindfulness practice community where monks and nuns live and thousands of lay people from all around the world visit and practice together each year. His mildness and modesty, his great commitment to relieving suffering in the world and the fact that he deeply lives what he teaches makes him a truly beloved teacher. His capacity to convey the essence of Buddhist teachings in simple language and concepts and applying it directly to practice in daily life, makes his teachings easily applicable for everyone.